Edited by Matthew Beaumont and Gregory Dart, 2010. Verso. 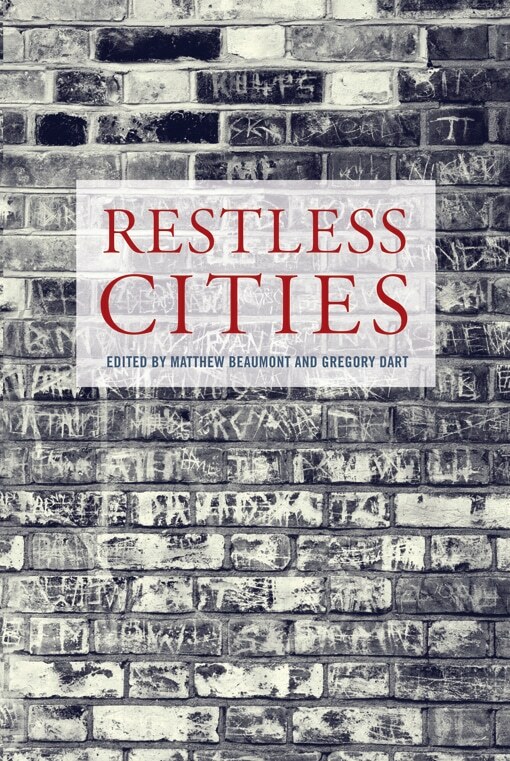 A wide ranging collection of authors writing about the different ways we live, experience, traverse the city — and thus also serving as a possible model to write about and try to understand those things. They are a very accessible series of meditations really, no footnotes or endnotes, a list of readings at the end of each chapter rather than bibliography. Each is centered around a verb: Archiving, Bombing, Commuting, Convalescing, Daydreaming, Driving, Falling, Imaging, Inhabiting, Lodging, Phoning, Potting, Recycling, Sickening, Waiting, Zigzagging. Interesting that each author approached these themes far differently than I would have — a good counterpoint to my interior voice and pointing the way to my enjoyment. A new way of thinking about the city in connection with a way of being or acting within it. Depending on the author, and, to be fair, my own preoccupations these days, these were more or less rewarding encounters. For Derrida, the archive is first of all a physical location, a place of deposit–like the Archivo de los Indios…Secondly, for Derrida, the archive is the site of a conflict between the urge to preserve and the urge to destroy, between remembering and forgetting. Archival action consists in the activities of accumulation, classification and consultation: it happens in the present, but its true time-frame is the future. Archives are always of the future; what we make of the pasts that we are made of. The cityscape, its streets, monuments and open spaces, its slums and beaux quartiers, are all the products of accretion, juxtaposition and transformation, but this history is made available to us at the surface. The city wears its heart on its sleeve (12). As for Mumford, so too for Debord, the ideal city was one in which all human creativity would be maximized. It would be an imaginatively suggestive space, not a streamlined or spectacular one. Such a city would be to some degree structured like the unconscious, a realm in which all elements would exist in an open relationship with one another. It would be a multi-layered space, difficult to control, impossible to plan, the ultimate success of which would be gauged by the ‘situationist possibilities’ it made possible. What is more, the Situationist dream city would be inimical to daydream to the degree that it would do away with the need for it, re-dissolving spectacle back into situation, and fantasy back into play (91). I’ve enjoyed thinking about how that would work, what that would look and feel like, if I feel threatened by a city that is inimical to my daydreaming. I can’t visualise myself without my daydreams, they are so much a part of me, particularly when I ride public transportation. They are where I work out stories and when my unconscious works best to unknot that problem I’m having in my thesis or my writing. Driving seemed to miss the joy, the music turned up all the way, the warm wind blowing through your hair, the road before you, the power to go anywhere, the control over your small domain, the pleasure in hugging curves and shifting gears smoothly. In short, the awesome visceral experience that driving can be…though it too often is not, especially in this country. I’m remembering those trips from Tucson to the mines near Green Valley to deliver maps for my dad, driving our boat of a buick older than I was down the windings of Mission road, a two lane highway through the res with its shot up street signs and its lack of traffic. I guess I was lucky. And I suppose that is not driving in the city, nor is Tucson a city in any European sense. ‘Falling’ I loved, Marshall Berman I love because he understands the meaning of home and of losing home, the power of city governments to tear down and destroy and ruin and lay waste and the echoes and unending sense of loss that it leaves in the lives of hundreds and thousands of people. Urbicide. The death of buildings, urban fabric, community, and individual hopes and homes. I like Patrick Keiller as well, his essay ‘Imaging’ is included in his latest collection where I first read it — though I can’t read anything he writes without hearing it spoken by the narrator of the Robinson films. Which I enjoy greatly I confess. I quite adored ‘Potting’ by Kasia Boddy, a history of the geranium from its early rarity and thus high class beginnings through its sensual teens (just think lips of geranium red) to a long history of bright colour and sturdy uprightness loved by some and despised by others. I was sad to hear William Morris was of the latter. We can’t all have gardens, we can’t all escape the dirty concrete city into a backyard or a summer home or a holiday trip. We can all have a geranium on the windowsill. The geranium through literature is a barometer not just of gender relations, but of class-inflected feelings (and judgments) about the city and the home. This was a brilliant exploration of the city through the popularity and use of a flower. The final essay on ‘Zigzagging’ by Mark W. Turner was also very powerful, a cry against the straight lines of City Beautiful and le Corbusier, the careful planning and rationalisations of the whole of life made possible by creating a perfectly rational environment. It is a celebration of the bent, the queer, the spontaneous, the unplanned, the poetic. It echoes Dart in some ways, but questions our adherence to that cannon (hurrah! ), drawing instead on the glories and dangers of living itself, of cruising, of queerness, of encounter. I loved it, and the importance of the message and the passion of it were a good way to end the collection, as not all of the essays were quite up to that standard. There’s one about perfect coffee and donuts that name drops a stay in every cultural capital of the world…and it is dismissive of Effra Road here in Brixton. But never mind. There is a lot to think about here, and it will change the way you see certain things. Geraniums at the very least.